A flag installation ceremony is held to honour the newly-elected non-permanent member countries to the Security Council for the term 2019-2020. 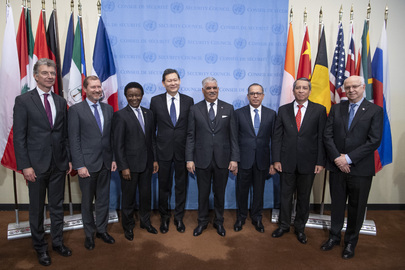 The presidency of the Security Council for the month of January is represented by Miguel Vargas Maldonado (centre right), Minister for Foreign Affairs of the Dominican Republic; Francisco Antonio Cortorreal (third from right), Permanent Representative of the Dominican Republic to the UN; and José Singer, Special Envoy of the Dominican Republic to the UN. Also pictured from left to right are Christoph Heusge, Permanent Representative of Germany to the UN; Marc Pecsteen de Buytswerve, Permanent Representative of Belgium to the UN; Jerry Matthews Matjila, Permanent Representative of the Republic of South Africa to the UN; Kairat Umarov, Permanent Representative of Kazakhstan to the UN; and Dian Triansyah Djani (second from right), Permanent Representative of the Republic of Indonesia to the UN.